“Following a month-long work experience placement at the Hand and Flowers, I went back to college and I found myself coaching my teachers on the advanced kitchen skills that I’d learnt,” said George O’Leary, the 21 year old, Demi Chef de Partie at the two-Michelin starred Hand and Flowers, in Marlow. George had his mind-blown by the high-level kitchen skills that he had learnt during his work experience placement, before he went back to the final semester of a one-year higher diploma course at Reading College. At college George learnt the basic kitchen skills including how to control the knife, frying, braising, which put him in good stead before he stepped up the pace in the industry. “I have been serious about my career in the kitchen since Home Economics classes at school, but following the work experience placement, I knew exactly where I wanted to be. Since then I’ve been progressing my knowledge, skills and have been moving up the career ladder for four years,” said George. Now on the second step of the career ladder, George currently works as a Demi Chef de Parti, on the sauce station in the kitchen. “I am responsible for all of the sauces for the meat and the fish. I arrive at the pub at 7am and organise the fresh produce deliveries and sort the bones for the stocks and bases. Later, I work on the mayonnaise and the base for the sauces. I set up for service and clean down the kitchen, which is a big job as we do 80 covers for lunch and dinner each day. I repeat that sequence five times per week. George stressed that chefs, at all stages of their careers, learn from the team around them and that everyday really is a school day in the kitchen. Intricate techniques are swapped in the kitchen, which save time and create astonishing flavours. “As a chef, I don’t have one all-time favourite dish, I enjoy constantly learning and developing new dishes. At the moment I am enjoying cooking birds on the crown, which is a whole bird with the legs and wings removed to give you a joint of white breast meat on the bone. That is something that I have learnt from the head chef, Aaron Mullis. [link here to Aaron interview]. 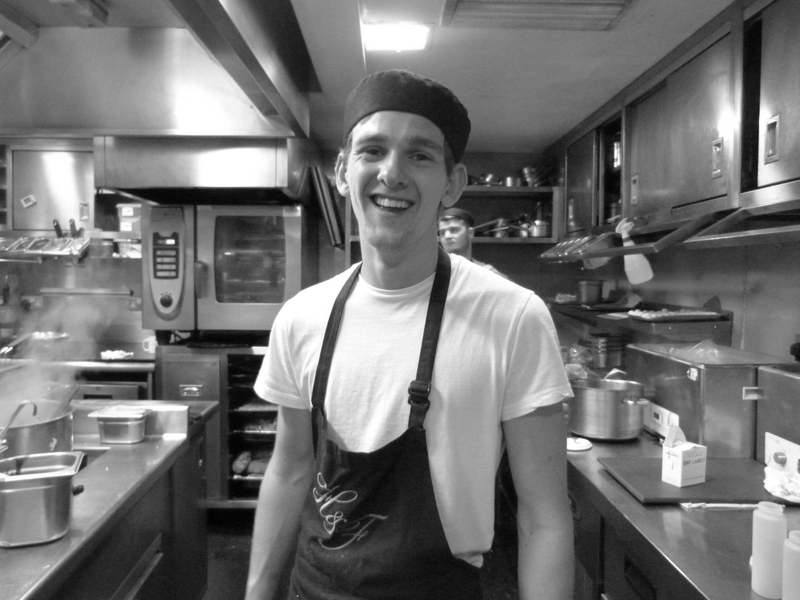 Looking to the future, George aims to continue working hard to become a Head Chef. But he stated that a career as a chef presents endless opportunity to travel the world, cook and taste exotic and delectable food of the highest standard. Click follow to be the first to receive Pub Chef Passion blog updates.